Last winter was difficult for Clara, my nineteen-year-old daughter. Like me, she is a high-functioning neurotic—my phrase for what clinicians call people with Generalized Anxiety Disorder. Waves of dread often wash over us, but we keep our footing. There’s a quick-stepping alertness to our demeanour, like that of hurrying sandpipers on the tide’s edge. We take flight and settle. For various reasons, Clara had been unhappy, and her unhappiness intensified her natural anxiety. Her GP prescribed the antidepressant Cipralex, but it didn’t calm her. Instead, it made her feel numb. Insomnia became a problem, as if she’d had too much caffeine. So that spring, the doctor suggested a new drug, Trintellix, which Health Canada approved in 2014 for the treatment of “major depressive disorder” in those over the age of eighteen. I remember sitting in my Honda looking at the sample package, with Clara beside me, and noting the package’s black-box label, which warned of a heightened risk of suicidal thinking and behaviour in children, adolescents, and young adults. “You’re not a doctor,” Clara said, with trademark teenage scorn. Fair enough. Doctors know what they are doing. I had my doubts, but I was no longer her guardian. She swallowed her first capsule of Trintellix that evening. “I genuinely want to kill myself, and I’ve never had that thought before.” She was frightened by this turn in her mind. I tossed aside my laptop, called my husband—who was working at home—and urged him to whisk her to the emergency department at the Centre for Addiction and Mental Health (CAMH) in Toronto. After interviewing Clara, the CAMH staff authorized immediate discontinuation of Trintellix. For two days, we had her sleep in our bed on a sort of impromptu suicide watch, until the alien pull to self-destruction receded. Over the ensuing months, as Clara worked with a kind therapist to resolve what was troubling her, she resumed being a sandpiper. It’s not perfect, as those of us with anxiety would agree, but for the moment, it felt safer. There was just one thing left to do now that my daughter had been prevented from killing herself: attempt to understand why she had wanted to do so in the first place. Between 2010 and 2013, antidepressant prescriptions for Canadian children under eighteen jumped by 63 percent—in total, more than five million were issued in that time. The number comes from a recent study published in the Canadian Journal of Psychiatry in which researchers tallied drug-store transactions from across the country. The majority of those prescriptions were for selective serotonin reuptake inhibitors (SSRIs), a popular class of antidepressant medication designed to treat depression, anxiety, and obsessive-compulsive disorder by boosting the levels of serotonin in the brain. The basic theory has been that more serotonin—sometimes known as the feel-good chemical—can help strengthen the brain circuits that regulate mood. “Our study could be a good-news story,” says Mina Tadrous, the study’s senior author and a research associate at the Ontario Drug Policy Research Network, “in that doctors are identifying more teens with mental health challenges. But the bad-news story would be that it’s much easier to give a pill than talk.” Tadrous worries that the uptick in prescriptions might be a phenomenon called “indication creep,” which occurs when doctors have the discretion to repurpose drugs indicated for other uses, leading to an increase in off-label—or unapproved—prescribing. Health Canada has never officially approved SSRIs for children under eighteen. Yet some doctors believe the benefits of off-label prescribing outweigh the risks. So what, in fact, do we know about the risk-benefit ratio of SSRI use in young people? The path to understanding the efficacy of SSRIs in treating mood disorders in the general population has been a muddy one. Prozac was the first to come to market, in 1987. An article reporting that “intense suicidal preoccupation” might be one of the adverse reactions to the drug was published soon after. Pharmaceutical companies, however, had much to gain by touting SSRIs as personality-fixing miracle drugs. Several of those drugs—Paxil, Zoloft, Effexor—came down the pipeline in fairly rapid succession. 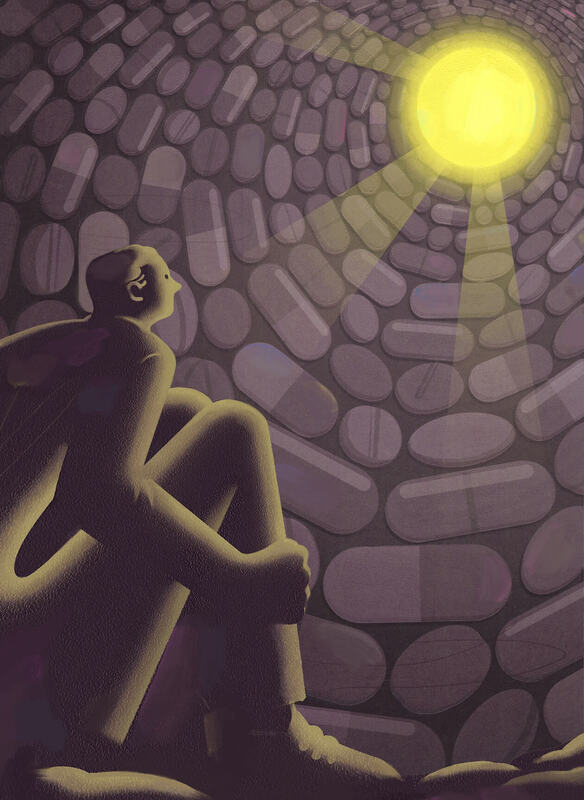 From 1988 to 2008, the rate of antidepressant prescription in the United States increased by nearly 400 percent. Part of this increase came from the fact that sales reps, eager to maximize sales, persuaded doctors to prescribe off-label. In the mid-’90s, the England-based company SmithKline Beecham (now called GlaxoSmithKline) funded a landmark clinical trial, known as Study 329, which explored the safety and efficacy of Paxil for adolescents. Published in 2001, Study 329 reassured doctors that Paxil was an acceptable remedy for anguished teens. Sales soared. Skeptics, however, raised questions. Some of the study participants, it emerged years later, entered the trial only mildly depressed, but wound up hospitalized once on Paxil. In 2004, Jane Garland, then a professor of psychiatry at UBC, wrote that “the authors dismissed this result by stating that these psychiatric adverse effects were not attributed to the medication—despite the fact that numerous reports of agitation and suicidal behaviour in young people treated with SSRIs have accumulated since the 1990s.” Indeed, enough evidence had accrued from clinical trials and lawsuits that both the US Food and Drug Administration and Health Canada mandated a warning for pediatric prescriptions of SSRIs—a warning they extended to cover eighteen-to-twenty-four-year-olds in the early 2000s. The sidelining of side effects can produce the impression that they are too rare to offset the benefits of a drug. And the medical community is wary of depriving people of treatment that could be beneficial. “We don’t always do well in healthcare with communication of risk,” Tadrous says. “We don’t want to scare patients away.” Health care professionals want to heal, and the fear of dissuading young people from taking what are generally viewed as healing meds can be strong. Yet, by relying on industry-funded research that can sometimes overplay the positive treatment impacts and obscure the potential harms, doctors can inadvertently become careless. A case in point is the story of John David Wood, an ambitious university student who found a psychiatrist in Toronto willing to prescribe an attention deficit disorder (ADD) drug to help him focus, even though he didn’t have ADD. Adderall was all the rage in college dorms when late-night essays were due. Wood powered his way toward an undergrad degree and then quit the drug cold turkey in 2004, not having been made aware of possible withdrawal effects by his doctor, who himself may not have fully understood those effects. According to rxisk.org, the FDA received 212 complaints of suicidal thoughts related to Trintellix—the drug prescribed to my daughter—between 2013 and 2016. The figure is slippery, because we don’t know how many people experience side effects they don’t report, or how many recognize that their medication may be affecting their behaviour. Meanwhile, the evidence that SSRIs have a complex impact on developing brains keeps mounting. In 2015, Israeli psychiatrists published a paper describing “SSRI-induced activation syndrome” in children and adolescents—a host of psychiatric changes, including anger, panic, irritability, and mania, that appear to be activated by this class of drug. Among those changes is a condition called akathisia, which is marked by emotional agitation and, sometimes, physical restlessness. Think of ’roid rage mixed with dread: a revving effect that leaves a patient so supercharged that suicide becomes plausible as an escape route. I thought of Clara as she’d been before she took Trintellix, which was originally intended to treat only those with major depressive disorder. She was working as a sales associate at a clothing store, alert and charming, going out for sushi after shifts, in constant touch with her friends, coming home with amusing anecdotes about customers. “I’m very aware that this is a hard message to sell,” Abi-Jaoude said. “A lot of my colleagues have used antidepressants and seen their patients get better. It’s hard to see there may be another reason they got better.” For instance, many regress toward their mean, in that they eventually return to their own emotional baseline. Decades ago, grief resulting from a traumatic life event such as a divorce or job loss wouldn’t have been linked to a biological illness. Symptoms had to be unduly severe or prolonged before clinical depression was decreed. But the DSM now stipulates a two-week threshold. Walk into the doctor’s office, proclaim your distress, and receive your pill. By the same token, as a culture, we tend to underestimate the power of placebo. But there is ample evidence that when patients believe they are getting treatment—even when that treatment involves pills containing only inert substances—they can also basically heal themselves. According to ongoing research at Harvard, placebos prompt the brain to release endorphins. Other elements of the brain’s reward system, like dopamine, are activated as well, resulting in a reduction of symptoms of depression, chronic pain, migraine, and other conditions. Regardless of what SSRIs can or cannot accomplish as chemical agents, the very act of taking them tends to trigger this placebo effect. In other words, both the placebo and the drug can make people feel better on the basis of expectation of recovery. What this means is that antidepressants aren’t just failing to do better than placebo in clinical trials: in the treatment of depression, they might in fact be acting as placebos. My daughter, unable to find a psychiatrist after her run-in with Trintellix, had gone to her GP. As she was now leery of drugs, CAMH suggested a group therapy session, but the waiting list was about eight months long. She ended up paying to see a private psychologist, but many visitors to Stella’s Place don’t have that option, which is why most people seeking mental health treatment wind up at their family doctor or in the ER. Indeed, a 2012 survey by Statistics Canada found that only 65 percent of patients who sought out therapy felt their needs had been met. In contrast, among those who wanted medication, 91 percent reported getting the drugs they needed. In other words, if you’re a patient, it’s cheaper and faster to get pills, and if you’re a doctor, it’s easier just to prescribe them. And this despite research that suggests it might actually be more cost-effective to cover mental health services: in some cases, therapy works just as well as medication, and it can prevent relapses and reduce the number of doctors’ appointments and ER visits. Globally, there are a couple of developments that point toward healthier approaches to the treatment of mental illness in young people. One is personalized medicine based on genetic testing. As part of its research into psychotropic drugs, CAMH offers a cheek-swab test that can swiftly determine which, if any, agents a patient can metabolize. Its findings indicate that the presence of certain liver enzymes may affect how different people absorb psychiatric drugs . After the cheek swab has been analyzed, a report is provided that lists the antidepressants and antipsychotics that might work best for the individual—and, importantly, which medication to avoid. Clara now knows about the test, and is considering taking it in the near future. Also intriguing is the prevention strategy, cognitive behavioural therapy (CBT), which teaches people how to break the feedback loop between negative thoughts and feelings by showing them where their thinking leads them into trouble. First developed by American psychologist Aaron Beck in the 1960s, the approach’s effectiveness has been borne out in dozens of studies. A 2011 review of fifty-three studies involving more than 14,000 Australian youth at risk for anxiety and depression showed promising results for CBT. How does it work? When I was Clara’s age, I worried about serial killers. On any given day, I might find myself wondering, “What if there’s a man outside my window?” This thought would create a surge of adrenaline, a sudden physical tension. That reaction would then further alarm my mind, which would add a new catastrophic thought: “What if I can’t reach my parents?” Cue the shallow breathing. And around in a circle I’d go, feeling anxious feelings and thinking anxious thoughts. CBT teaches you to recognize what you’re doing before it spirals out of control. It’s now considered a first-line treatment in the United Kingdom: more than 500,000 patients receive the therapy each year, and 43 percent of them recover from their anxiety and depression. This could be the most effective—and least toxic—intervention ever devised. If children were taught to regulate their catastrophic thoughts and physical sensations, many could self-regulate before their mood intensified and became “diagnosable.” This would take us back to the time when we dealt, medically, with only serious clinical depression and other severe mental illnesses. The day that Clara first showed me her packet of Trintellix, we were driving to the country, to the simple A-frame cottage built more than a century ago by my great-grandfather. Here there is always healing in the quiet, even if we’re only staying overnight. And what do we return to? Twenty-four-hour news cycles, incessant social-media use, job insecurity, global warming. What’s not to dread? On World Health Day this year, Dainius Pūras, a doctor and a representative for the Office of the United Nations High Commissioner for Human Rights, made a powerful statement. By focusing so intently on the biomedical model of treating depression, he argued, we are diverting resources from the “social and underlying determinants” that may have a larger and more lasting effect on mental health: economic injustice, political oppression, social violence. “Mental health services, policymakers, medical students, and medical doctors have been misinformed,” he declared. While there’s an important role antidepressants can play in addressing severe depression, the use of psychotropic medication as first-line treatment, he said, is “unsupported by the evidence.” Before off-label SSRI prescription rates rise any further, perhaps it’s time to set aside the pill bottles. Correction: An earlier version of this story stated that the commercial name for the drug citalopram, for which Forest Laboratories funded an adolescent trial in 2004, is Cipralex. In fact, the name is Celexa. The same earlier version stated the author’s daughter, Clara, took citalopram. In fact, she took Cipralex, which is escitalopram. The Walrus regrets these errors. Patricia Pearson is a Toronto-based journalist and author of six books, including A Brief History of Anxiety...Yours & Mine, which was later adapted as a CBC documentary. Pete Ryan teaches illustration at Sheridan College. What Role Should the Media Play in Suicide Prevention?